Boring. Repetitive. Pointless. Frustrating. Too easy. Too hard. These were a constant flow of phrases from the mouth of my 8-year-old daughter daily about math. As a homeschooling mom, I was the one enforcing this curriculum on her each day as we dove into our math lessons causing some math anxiety for both of us. It wasn’t that they were too complex or above her head. She never struggled getting the right answer… she just hated that she HAD to. Barely into November of each school year, we’d both be at our wits end with the struggle. She hated drilling the facts, and I hated making her. Timed drills and flash cards were the only way I knew to give her a solid foundation, but it just wasn’t working. She fought me at every turn. Enter SimplyFun. I attended a friend’s Facebook party, and WOW… these amazing games looked like they could be the answer to our struggle. First, I grabbed Math Room, a game that teaches addition and subtraction in a timed setting. We began playing regularly, and within days the speed at which she could drill those simple addition and subtraction facts increased a ton. She was drilling, with a timer, FOR FUN, with her little sister, and her attitude when she sat down to her math lesson began to shift. I think I should also mention that my daughter loves horses. 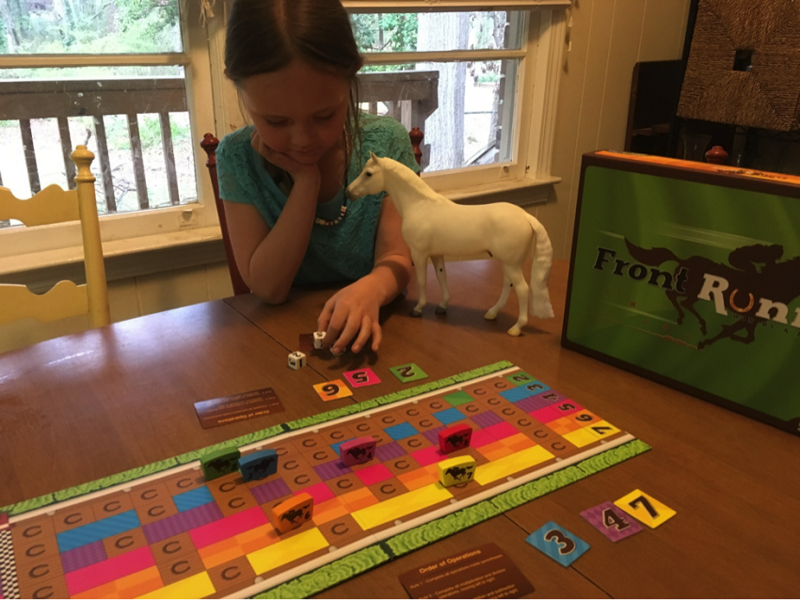 When I saw Front Runner was a math game AND featured horse races, I realized I found the answer to our problem. This was the perfect game for her. Not only did it feature her favorite animal, it helped her practice order of operations and factoring. We hadn’t arrived at order of operations in our math lessons yet, or discussed factoring, but after just a few runs of the game, she understood both concepts well. Her math skills have improved, but the biggest change the games have brought about was a complete shift in attitude about the entire subject of math. It’s no longer boring, it’s FUN. There is a POINT to these math problems: to win. There are simple and difficult levels of play, and she likes that she can choose what she wants to try. She looks forward to her math lessons, when before she would dread them. She’s even looking forward to starting division so she can factor even better for Front Runner! The girl who just a few months prior would only have disdain for math time now looks forward to it each day, and just might call it her favorite subject. All this thanks to SimplyFun games. SimplyFun Playologist Becky Phillips lives in suburban Atlanta with her wonderful Mr. Adventure husband and 4 (soon to be 5!) children: Annika (9), Nora Grace (6), Trace (4), Martyn (2), and TBD (Sept 2017). As a family, the Phillips’ spend a lot of time adventuring, riding horses, skiing, riding in airplanes with Daddy, playing outside, reading great books, and playing LOTS of amazing games. As a busy homeschooling mama, Becky loves being able to incorporate PLAY into their homeschool as a way to add smiles and build relationships WHILE learning.